Latest in this franchise, inspired by the late Tobe Hooper’s original horror classic, is a prequel that attempts to take us back to the youth of one Jed Sawyer, aka Leatherface. The film opens with young Jed (Boris Kabakchiev) getting his trademark chainsaw as a gift from his deranged mother (Lili Taylor), but not too keen on using it on the captive pig thief they mean to teach a lesson. When the clan murders a lawman’s daughter (Lorina Kamburova), her father, Texas Ranger Hal Hartman (Stephen Dorff) can’t prove it, but does get young Jed removed from the Sawyer house for child endangerment. He’s committed to an institution for wayward youth and there he is raised with a new name and identity. When four young inmates violently escape the institute with a pretty young nurse (Vanessa Grasse) as a hostage, their trail of blood will transform one of them into the mass murderer known as Leatherface. Latest film in this series is written by Seth M. Sherwood and directed by the duo of Alexandre Bustillo and Julien Maury who directed the over-the-top French gore-fest Inside. As such, the film does have some nasty gore and some really disturbing moments, including a shiver inducing scene of necrophilia. What the film doesn’t really have is a purpose. Do we really need to see Leatherface’s teen years? It may be somewhat clever that we don’t know which of the teens…well, it’s obviously not psychotic Tammy (Nicole Andrews)…is the grown-up Jed. We are kept guessing if it’s crazy Ike (James Bloor), the hulking Bud (Sam Coleman) or the somewhat noble Jackson (Sam Strike), who will turn out to be Jed. Once we find out though, it’s not the powerful revelation it should be. And this is where the film falters. Most of the flick is focused on these youth on the run causing bloody carnage wherever they go. It removes Jed from his clan for the first two acts and thus we really don’t get a sense of how the man became a monster, as we don’t really see him with his deranged kin and in their influence till the last third and then the transformation seems to happen all too quickly. True, the institute was almost a worse place than his childhood home and there is plenty of violence when they’re on the run, but like Rob Zombie’s Halloween, it almost takes away from the randomness of the character to try to explain his behavior through his constant exposure to horrifyingly brutal acts, even outside his bonkers family. Isn’t the maniac scarier when he is simply a maniac?…a natural born killer? Even in it’s final moments, we never really connect this young man with the monster, even when he dons his first face mask. At least Alexandre Bustillo and Julien Maury deliver some really twisted moments to keep the film entertaining on a basic horror film level and the carnage is very well rendered. It’s just it never completely feels like a part of the Texas Chainsaw Massacre legacy or adds anything really worthy to the lore. The cast are fine enough. The teen leads all do their parts in playing their respective roles. Nicole Andrews is chilling as the completely deranged Tammy, as is James Bloor as the violently inclined Ike who becomes her lover. Sam Coleman is the large but outwardly timid Bud, who becomes extremely savage once provoked. Strike is solid as the only escaped inmate with somewhat of a moral center and Vanessa Grasse is a likable heroine as the hostage Lizzy. The real standouts here, though, are veteran actress Lili Taylor as the out-of-her-mind Sawyer matriarch, Verna and Stephen Dorff as the equally psychotic Texas Ranger Hardy. The film should have focused more on them. 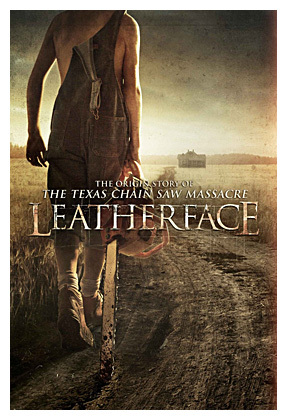 Leatherface was a decent edition to the Texas Chainsaw franchise and better than some of it’s predecessors. But it’s also one that never really seems necessary or overly relevant. The events portrayed can be disturbing and gruesome, yet we never really feel we are watching the birth of a monster, as we did in Bereavement for example. It is interesting that the film tries to keep us in the dark as to who actually is the grown up Jed Sawyer, but once we find out, it lacks the impact it should have, even when iconic chainsaw and skin mask come into play. Worth a watch for some chilling moments, but the sum of the parts is greater than the whole.